Troop 50 Scouts donned leggings, grease paint and headdresses Saturday evening as part of Cub Scout Pack 29's annual Arrow of Light and Webelos Crossover Ceremony. The ceremony, which took place at the Forest Ecology Preserve, involved nine Webelos Scouts crossing over into three Auburn-based Boy Scout troops -- with four of the nine choosing Troop 50. 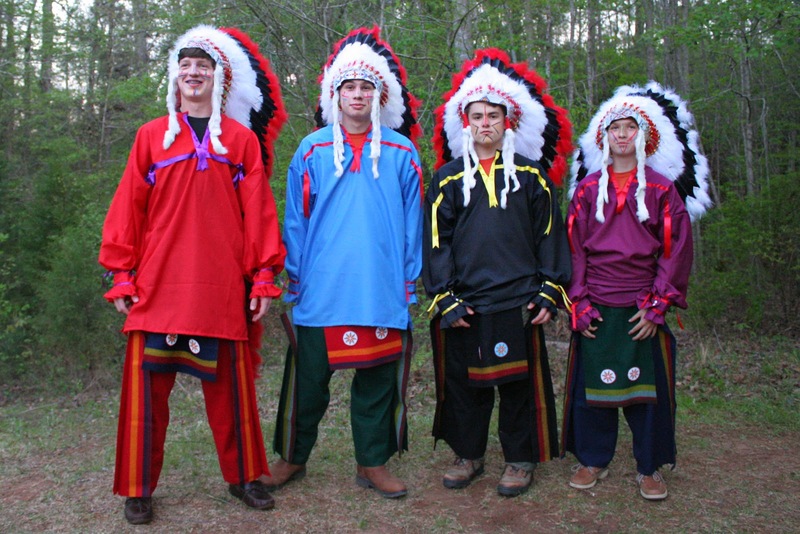 Davis, Kyle, William and Andrew (pictured above) participated in the ceremony by appearing as Native American principals who each represented one of the four winds -- North, South, East and West. The four were aided by other Troop 50 Scouts and leaders participating in the background as drummers and "backstage support." At the end of the ceremony, Webelos were escorted to different areas where each of the troops receiving their new Scouts were stationed. At the end of the ceremony, our new Scouts -- (left to right) Louis, Mark, Andrew and Michael -- joined the ceremony principals and Senior Patrol Leader Jake (far right) for a group photo. We're delighted they and their families have selected Troop 50 in which to continue their Scouting activities, and we wish them all much success on the Trail to Eagle! View more photos from the ceremony in our online photo album.